Diatoms are unicellular algae that inhabit both fresh and salt water, sometimes living together in colonies. Typically classified as members of the phylum Bacillariophyta, the estimated 16,000 species of diatoms that exist compose an important link in the aquatic food chain. Each individual diatom possesses a cell wall known as a frustule that consists of overlapping halves, similar to a pillbox. Covered in delicate markings and intricate designs, diatom frustules are primarily composed of silica and are valuable for testing a microscope's resolving power. 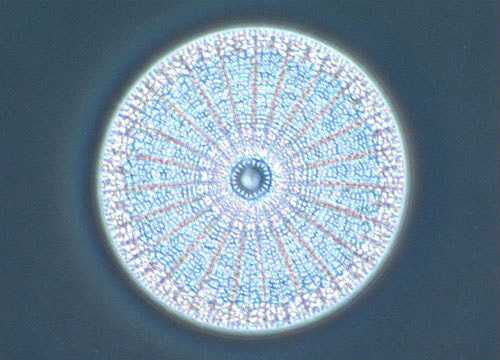 Reproduction of diatoms is usually asexual, the frustule halves separating and secreting new, smaller bottom halves. 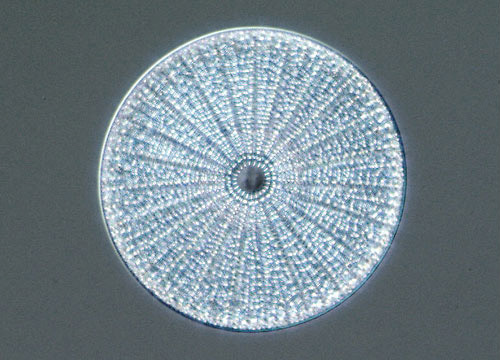 Since diatoms decrease in size each time they divide, periodic spore formations are needed in order for the diatoms to be restored to their initial dimensions. Diatoms, an estimated 6 million of which may be found in a single cubic foot of salt water, are both prolific and important. Most diatoms are free-floating and serve as a food source form many other animals. Diatomaceous earth, a material consisting of fossilized diatoms, is often a component of various products, such as filters, insulation, abrasives, paints, and varnishes. Moreover, the extensive fossil record of diatoms has made them extremely useful to scientists researching changes in ecological conditions over long periods of time.